I spent a good few weeks researching and reading up on my latest monster video editing box. Though it was expensive, I decided to go for the i7 3930K chip, a pricey $539 on sale from NewEgg. Listed below are the parts that I assembled for the box. The mainboard and the chipset were my primary concerns, but the other parts were chosen because they conformed to my build specs and they were on sale or discounted in one way or another during one of NewEgg's Build sales. Because I don't build too often, it took about a day to assemble the main board and the components in the above picture. It took another 1/2 day to port my four drive RAID 1+0 set from my old video editing workstation to this one. Of course, I had to create a new RAID set on the new box. I will no longer be using the trusty 3Ware 9650SE RAID card, as the new mobo has both Intel and Marvell RAID chipsets on board. 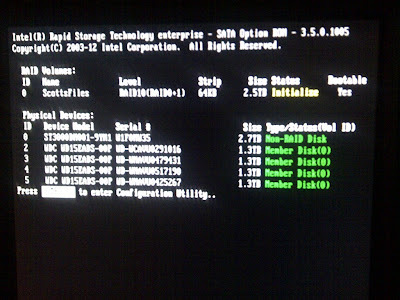 The Marvell only supports two drives, so I used the Intel to connect up my four 1.5TB Western Digital Green drives. 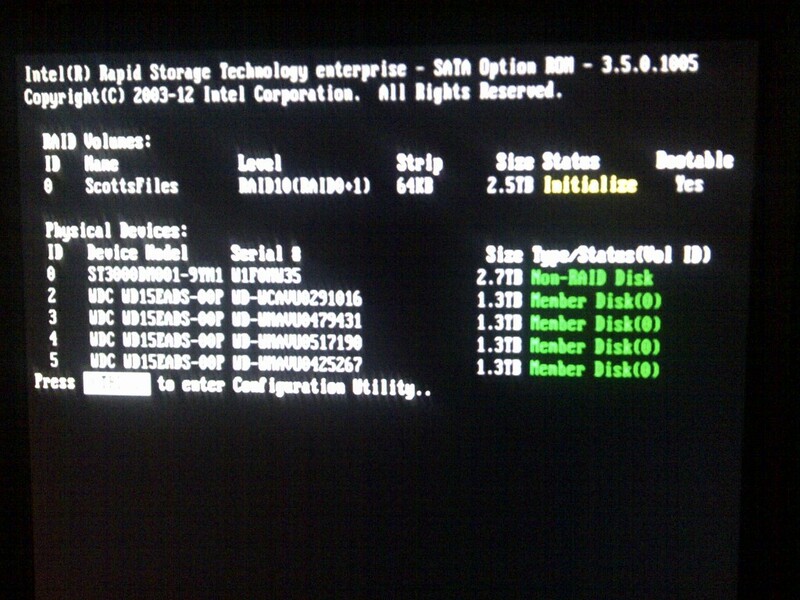 4) when the restore is validated as good, copy the files from the restore over to my new RAID 1+0 set. I love the Corsair 400R case. With the nice cable tunnels, I was able to keep the mainboard area pretty free of cables, though it doesn't look like it from the below pic. 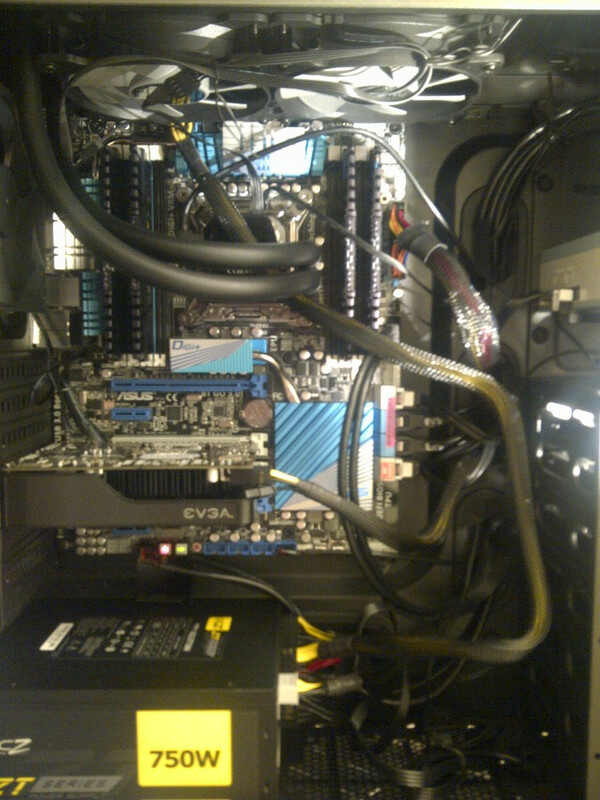 You can see the pipes to the Corsair H100i in the center of the photo. 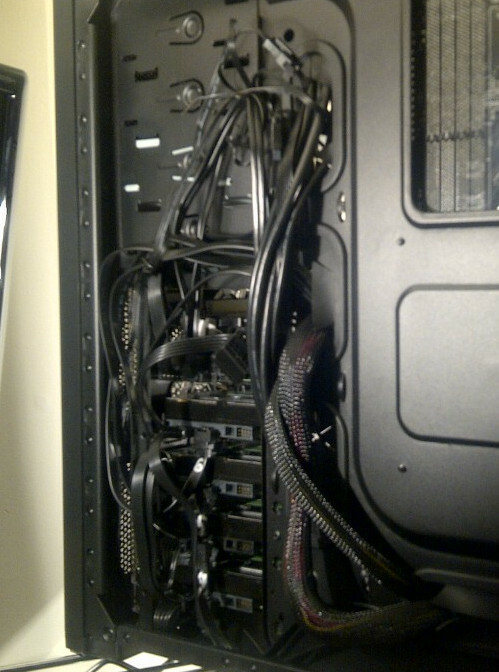 I'm not a great cabler and I just wanted most of the cables out of the way. 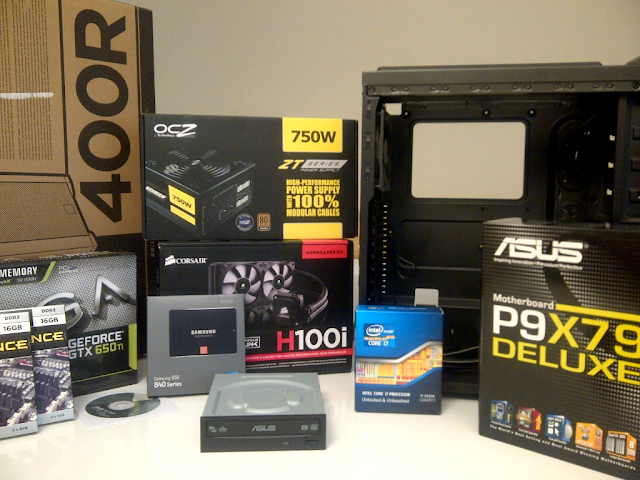 Given that there are five 3.5" drives, one 2.5" SSD and a DVD player in the box, I think I did alright. The real test was firing the box up for the first time. I was rather shocked when it did come up, mainly for the worry that the memory wouldn't be compatible. But it was. Also, I had invested a great deal of time before the build in reading the 176-page manual and watching a bunch of build videos listed at the bottom of this post. 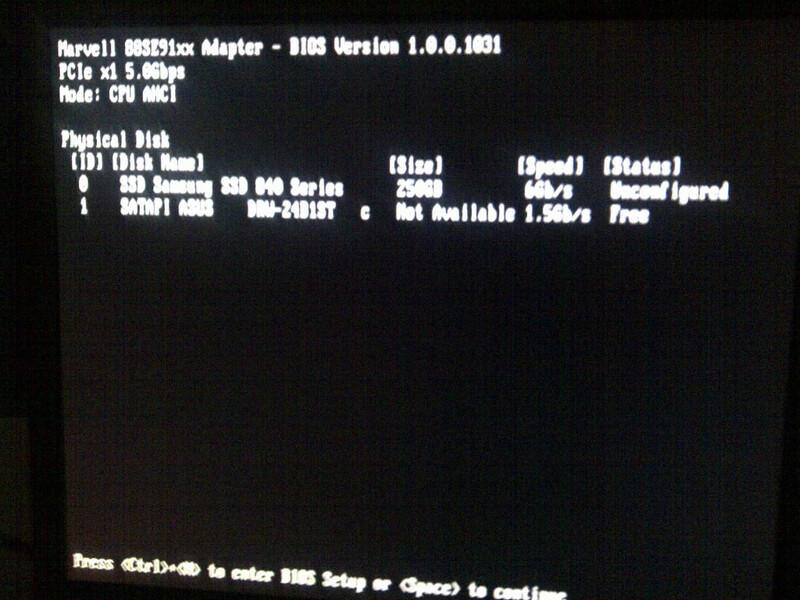 So the base build with a single SSD hard drive powered up successfully. Hooray! 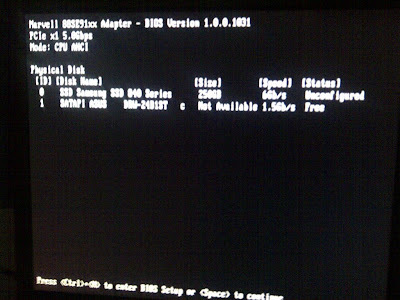 The next hurdle was installing a basic operating system, Fedora 18 64-bit on my single SSD in the machine. Again, surprisingly, this worked without a hitch. I had spent a good deal of time reading the FedoraProject's list of UEFI bugs and I was suspect of problems, but was very happy that I didn't encounter any. 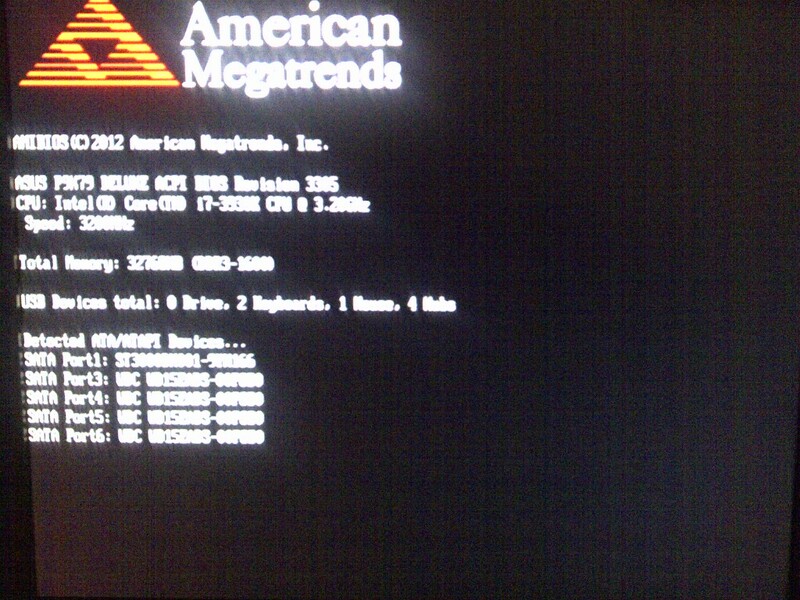 The American Megatrends BIOS and ASUS's UEFI BIOS screens are completely configurable and nicely laid out. I won't be using many of the options, but it is just a pleasure to have a system that is so well stocked, but boots up quickly. I'd say it takes about 30 seconds to get from cold start to my initial Fedora 18 grub2 prompt. I haven't overclocked the mobo yet, but according to what I've been reading and the fact that I have good chip cooling via the H100i, I should be able to push the i7 from 3.2 to at least 4.6Ghz. 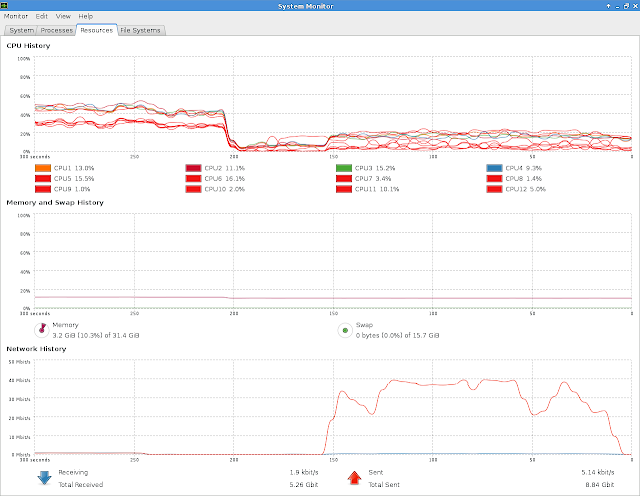 On the top row, the CPU History chart, you can see that my H264 video encode took about 40% of the CPU. 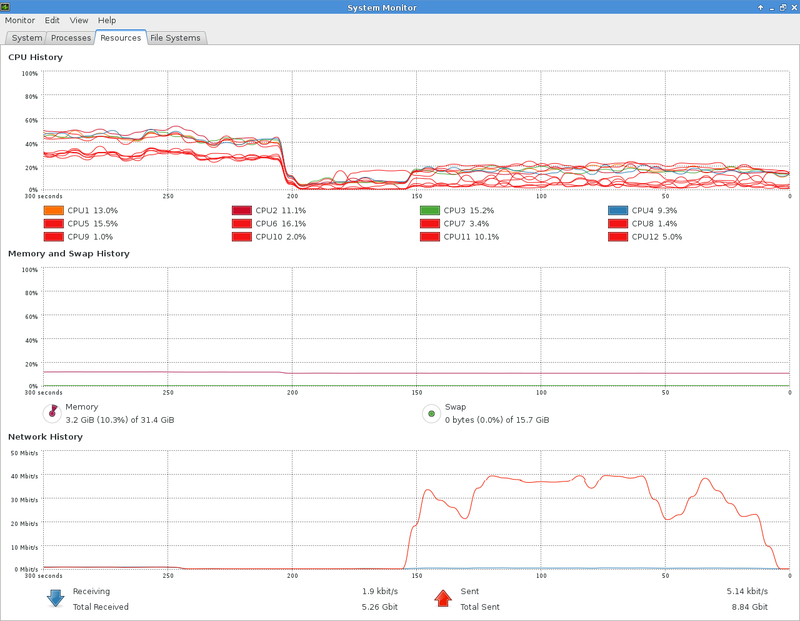 You can see all twelve CPUs being used. On the bottom row, the Network History, you can see my upload to Vimeo. The upload of my 530MB file took about 150s at a peak upload rate of 40Mbps. That 40Mbps upload is courtesy of FIOS. Next up: installing Windows 7 Professional so that I can do some baseline performance measurements. /usr/bin/touch -d "Sat Jan 22 11:58:29.0000000000 2011" ./sodo/.netbeans/6. Then I plopped a #!/bin/bash at the top of the shell script, chmod a+x fixDate.sh, and off I went. But the script worked, thankfully! Unfortunately, I wasted about two hours dealing with this today. Super drag! Haven't figured out why tho. Argh. But can I play pong on it? It will send a slight voltage through the mouse to your fingers if you play something as decidedly low-tech as Pong on it.